Geek Stuff- Pop Culture Podcast and Community » Blog Archive » Geek Flea 7 This Saturday! 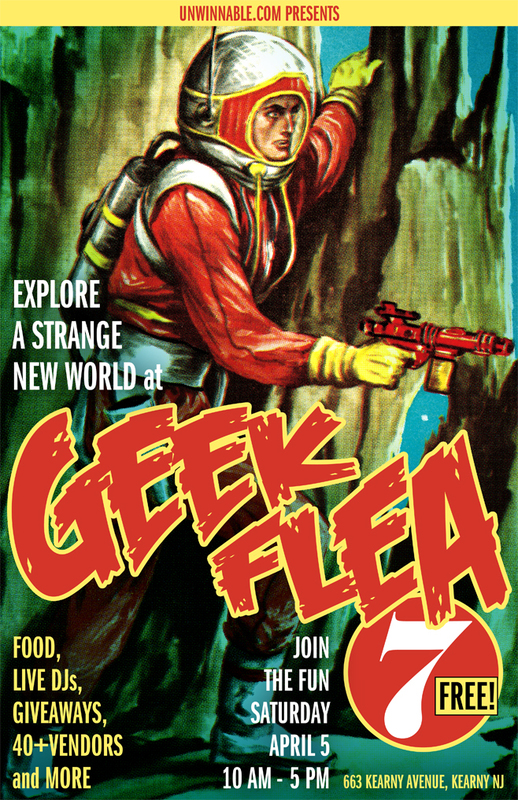 Geek Flea 7 This Saturday! The Folks at Unwinnable have issued the following press release for the upcoming Geek Flea 7 coming this Saturday April 5th. Don’t forget Big Kev and OG will be there hanging out all day and selling off stuff from their personal collections. Kris Dulfer from Kid Ink Industries will be there as well selling some awesome resin work and Rob “The Mayor and giver of lollipops” Losito will be there as well and may have some goodness from Suburban Vinyl as well. Check out the full release below! New Jersey Gets Geeky At Geek Flea 7! Kearny, New Jersey (March 31, 2014) – April 5th will bring with it an end to this bitter cold and the return of GEEK FLEA to the First Presbyterian Church of Arlington in Kearny, New Jersey! This family friendly, FREE event boasts two floors with over 40 vendors selling everything from toys and games to comic books and T shirts that will make your inner child (or actual child) do a happy dance, and amazing artists showing off their latest creations. You’ll also find mouth-watering food and drinks to fuel your dream toy hunt, and groove to live DJs as you wait to see if your raffle ticket will score you free T shirts, toys or even a PS4! Admission, as always, is FREE FOR ALL. GEEK FLEA takes place this Saturday, April 5th from 10am to 5pm at the First Presbyterian Church of Arlington – 663 Kearny Avenue in Kearny, New Jersey. See you there!